Anderson Cooper once joked that he has always lived in the "shadow" of Ron Burgundy during his time on CNN. Well, it's true. A new study by Market Wired looking at the most popular news anchors on social media found that Ron Burgundy, Anderson Cooper, Megyn Kelly, Katie Couric and Wolf Blitzer are the most talked about. The study determined which anchors from top broadcasts were mentioned the most on social media like Facebook and Twitter, and how favorably. Cooper fell right behind Burgundy with 560,425 mentions (85 percent favorable). During a segment of Cooper's "Ridiculist" on Wednesday night, the "AC360" host defended his favorability ranking by saying that the negative ones consisted of "inscrutable late night rants, unfathomable filth and just direct threats of violence." He called the data "skewed" and claimed that the only reason he came in second place was because "there's no movie about me." Of course, Cooper could have just used the excuse that Ron Burgundy is not real, so he merely lost to a made-up, fictional character. 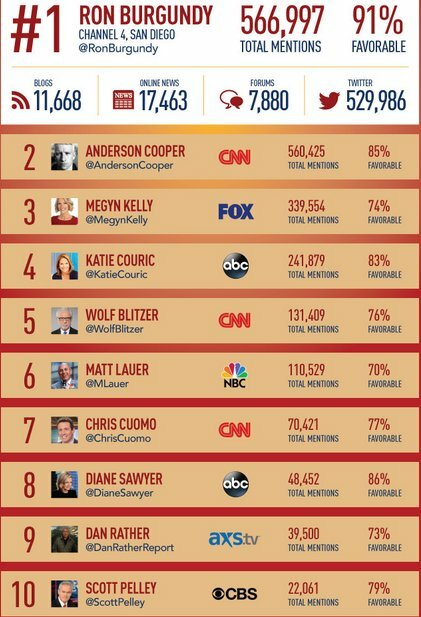 Therefore, if we're counting only real-life news anchors, Anderson Cooper is social media's favorite.